Bayer, the global chemical company, is manufacturing a chemical that new evidence shows is killing off bees. 30% of our crops -- and 90% of wild plants -- rely on bees to thrive. Bayer has paid for biased research that “proves” its chemical isn’t a problem. But now independent scientists in Europe have discovered that Bayer’s chemical is a high risk to bees. Bayer makes everything from Alka-Seltzer to Berocca to flea treatments for pets. Bayer knows that it needs to keep its customers happy. If it realizes that its customers are outraged, it will have to pull its bee-poisoning pesticide off the market. 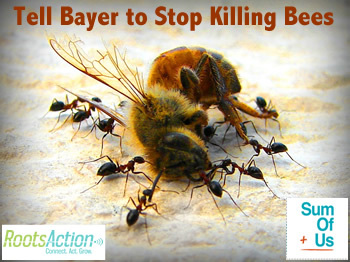 Join RootsAction and SumOfUs in signing this petition to Bayer! By signing this petition, you will receive updates on this and other campaigns from SumOfUs.org. Bayer: Withdraw neonicotinoids from the market. Feel free to include your own comment. 47066 Tue Jul 29 00:23:24 EDT 2014 Beth Janssen CO , US Listen to the bees and you will hear in their buzz, "if you take us down, we'll take you with us..."
47060 Sun Jul 13 16:03:43 EDT 2014 Anonymous Please, for the sake of mankind, STOP the madness! Your pesticides and insecticides are destroying the foundation of our food sources. What a horrible company to do such a thing. I may, take a large position More....in your firm financially, just to appeal to the Board of Directors to address this issue and to establish, in legal form, that continuance of this behavior is harmful to the very consumers that you seek to profit from. Just awful. 47051 Sun Jun 15 23:01:11 EDT 2014 Emily Dale Jacksonville, FL , US By now you should know that people are rethinking the fact that you have been known as "The Aspirin Company" and are now "The Bee-Killing Company". What a downfall! 47050 Sun Jun 15 18:45:29 EDT 2014 Maggie Barrington Jacksonville, FL , US Bayer: Withdraw neonicotinoids from the Shelves in stores, your Pesticides and Insecticides are KILLING the BEES and BUTTERFLIES!!! We cannot continue to grow many foods without the BEES to Pollinate More....our Fruit and Vegetables. The dangerous chemical Bayer makes is a neonicotinoid. Neonicotonoids are soaked into seeds, spreading through the plant and killing insects stopping for a snack. These pesticides can easily be replaced by different chemicals that don’t soak so deeply into our crops. But companies like Bayer make a fortune from selling neonicotinoids - so they’ll do everything they can to protect their profit. It’s not just bees that are hurt by these chemicals. Research on rats found that neonicotinoids may also hurt human health, especially the developing brain. But as with the bees, we don’t know as much as we should about the health hazards, because companies like Bayer spend millions on research which muddies the water with biased studies. For Bayer, people’s health plays a distant second to their huge profits.